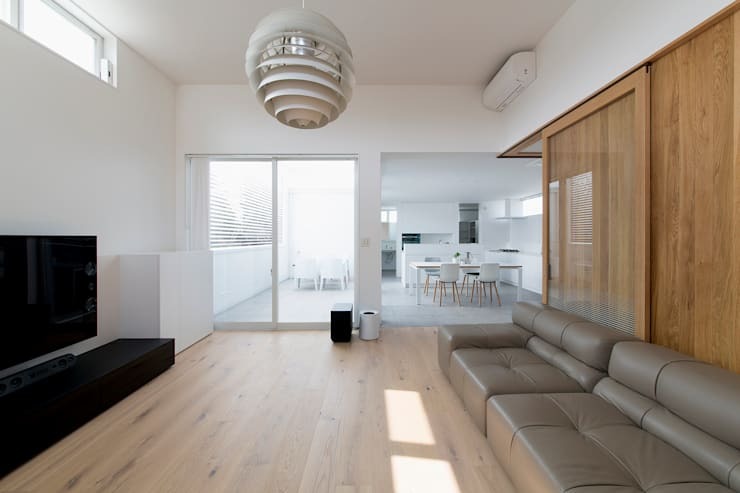 This lovely abode, designed by the creatives at Japan's Love Design Homes, presents a simple yet stylish modern take on a family residence. Located on the site of a former golf course, the home cuts a fine figure in black brick from the street, before transforming into an open and light dwelling once past the threshold. High, white walls and ceilings and plenty of windows and glass doors invite light to circulate throughout the interior, to stunning effect. 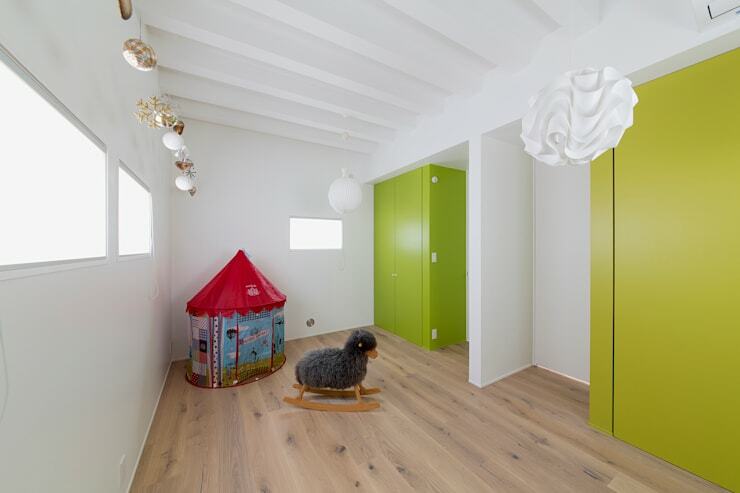 The flooring throughout alternates between timber panels and flowing, grey tiles, ensuring that the home's palette remains tranquil and muted, with the exception of a few sporadic splashes of colour designed to enliven the kids room. Best of all in this home is that there is plenty of space to relax, with an indoor sun room included, to which the entire family can retire and unwind, and an expansive backyard flowing from the rear, providing a lush locale for outdoor activities. 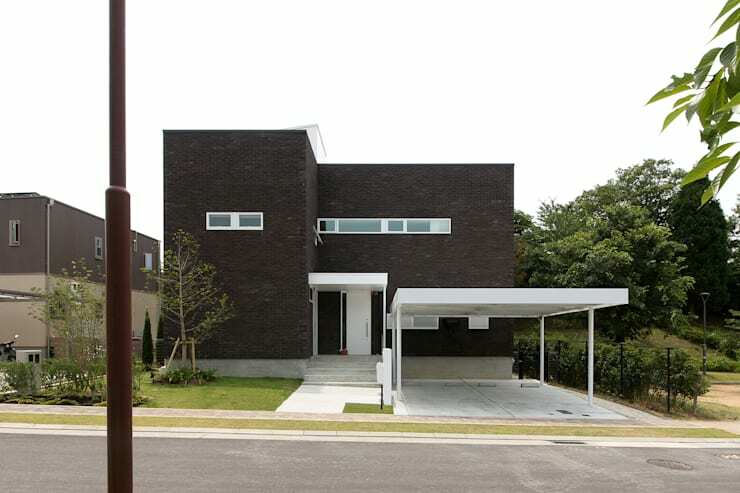 The facade of this home is strong yet simple, with two cubist boxes of black brick rising up behind white shelters constructing a car port and entryway. 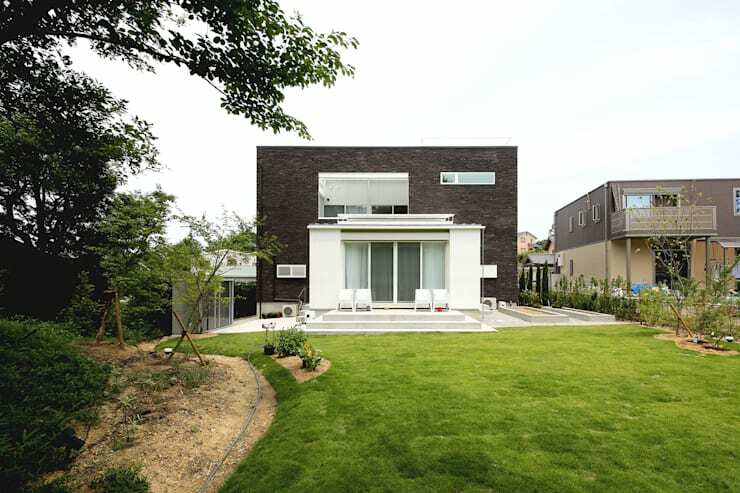 The design is understated and modern, with a simple, structured garden bordering the front of the home, while a flowing backyard has been included behind. Moving inside and we're met with with a wonderfully light interior that flows with ease between a semi-enclosed living room and a kitchen and dining space. Wood and white prevail throughout the decor, with the home's high walls and ceilings creating a spacious atmosphere. Furnishings have been kept stylish and modern, with the grey, leather lounge suite seen here inviting relaxation in front of the television, and the white dining setting in the distance providing a lovely locale for a family meal. The kitchen and dining room in this home have been combined for a casual, communal feel, with the space beautifully lit by glass doors, inviting entrance to a cosy, bright balcony. The timber flooring of the living room has been exchanged for grey tiles, providing a contrast of texture, while keeping the decor pale in order to capitalise on the steady influx of natural light. A raft of storage has also been included for functionality, seen in the series of cabinets running up the left hand side of the room. 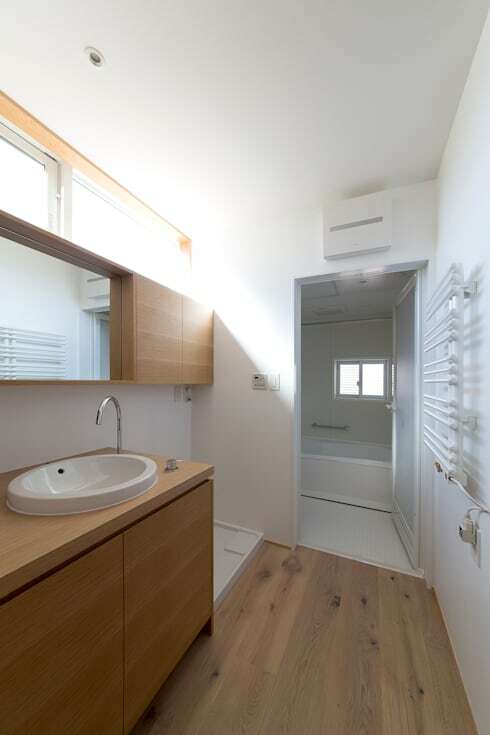 The home's bathroom also basks in the classic decor of wood and white, creating a serene atmosphere as sun filters into the space through small windows. A wooden sink unit and floating vanity add a sense of warmth within the room, while the bathtub and shower can be seen in the adjacent room, which is dressed entirely in white for a pristine effect. What would a family home be without a space for the kids to play and create? 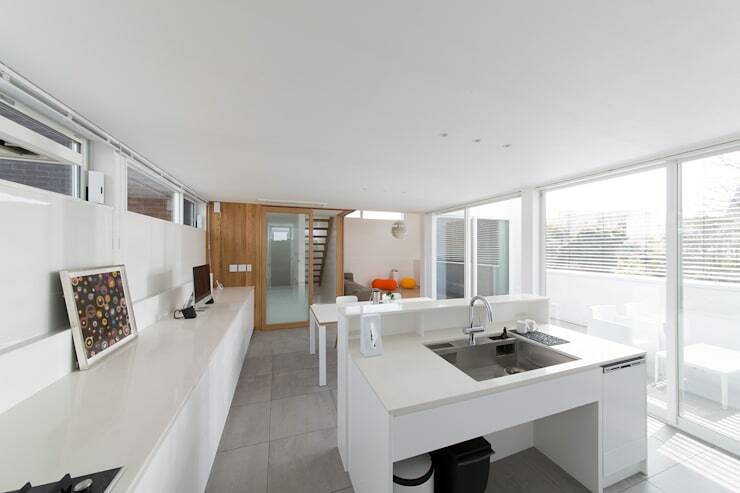 This home certainly doesn't disappoint, with a lovely children's room included. The space retains the home's prevailing decor in order that it can be re-purposed as the family ages and its tastes change, with the exception of two playful, green cabinets which can be used for storage. While's it's important for the kids to have their own space within a family home, it's also great to have an area to which the adults can retire for rest and relaxation. This sun room is perfect for such occasions, with light flowing in through floor-to-ceiling windows and through a series of skylights, illuminating the room's muted decor and stylish, contrasting furnishings. Moving through to the exterior of the home and we can see that the designers have included a lush and lengthy back yard, to accommodate plenty of family fun outside. A raised, concrete deck serves as a relaxing locale from which the occupants can enjoy a sunny afternoon, while the flowing, green lawn provides ample room for outdoor activities. A series of garden beds have also been included, in order that the family can have plenty of fun creating their own natural surrounds. Inspired by the open and refreshing atmosphere within this family home? Then have a look at these 6 ways to achieve a healthier home for more ideas on how to create the best environment for your family! 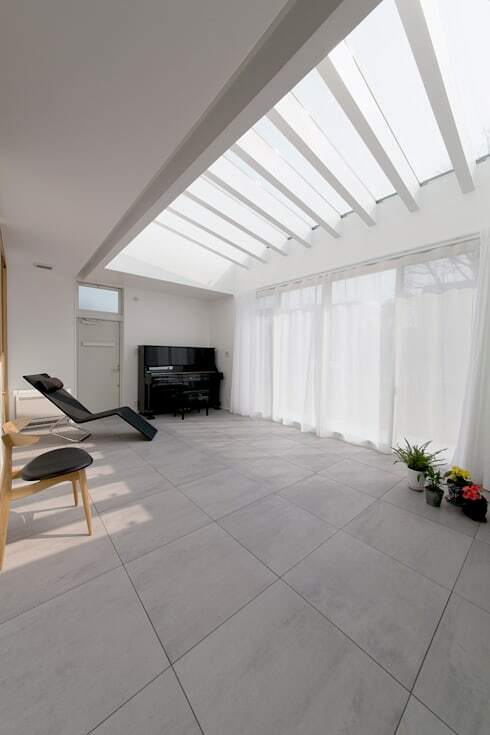 What do you think of the sun room in this lovely home? Is it something you'd like to include in your own residence? Tell us below!